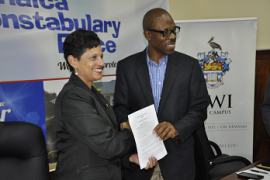 Principal of the Open Campus of The University of the West Indies (UWI), Dr. Luz Longsworth (left), beams with pride beside Jamaica’s Commissioner of Police, Dr. Carl Williams, after both signed a formal Memorandum of Understanding for the development of academic programmes and other educational initiatives at the Commissioner’s Office on August 8, 2016. Commissioner Williams spoke of the importance of higher education in the professionalization of police services in Jamaica and the world that would lead to greater levels of creativity and problem-solving skills, in addition to the attributes of commitment, bravery and common-sense not usually found in university courses. The Principal also described the educational opportunities available to police officers through the Open Campus that will assist them to become even stronger and more innovative and sophisticated to tackle the root causes of street and gun crimes. She also reiterated the growing need to advance and improve white-collar crime solving and community policing in Jamaica and across the Caribbean in order to attack and dismantle more sophisticated criminal networks that specialise in cyber-crimes, human trafficking, terrorism and fraudulent financial schemes.